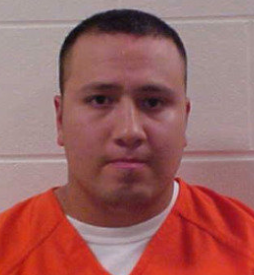 NEWKIRK — An initial hearing was set today for 9 a.m. Friday, Feb. 15, in Kay County District Court for Luis Octavio Frias, 34, charged in the Aug. 8, 2013, stabbing death of his estranged wife, Janett Reyna, in Blackwell. Reyna, who was 29 at the time of her death, was stabbed 41 times, according to investigators. The stabbing occurred at her mother-in-law’s apartment, in front of her three children with Frias. Frias was ordered held without bond Friday and was jailed after a probable cause appearance today and the return of the original felony warrant. An arrest warrant For Frias was issued on Oct. 4, 2013, in connection with the death. The original information on the court charges was amended Friday and Frias now faces two charges: Murder in the first degree with deliberate intent, and a felony charge of conspiracy. Frias was captured last week in Mexico, where he was located after a tip generated from the television show “In Pursuit with John Walsh.” Mexican authorities accompanied him to the Dallas-Fort Worth Airport where U.S. Marshals arrested him. The warrant was officially signed upon Frias’ reentry into the U.S. and Frias was restrained using handcuffs assigned to Reyna during her tenure as a Blackwell Police Officer. Reyna attended Northern Oklahoma College and graduated with an Associate Degree in Criminal Justice. In 2008 she completed CLEET training and became a police offer for the Blackwell Police Department. In 2012, she became the Director of the Domestic Violence Program for the Ponca Tribe. She was residing in Blackwell, OK with her children at the time of her death.